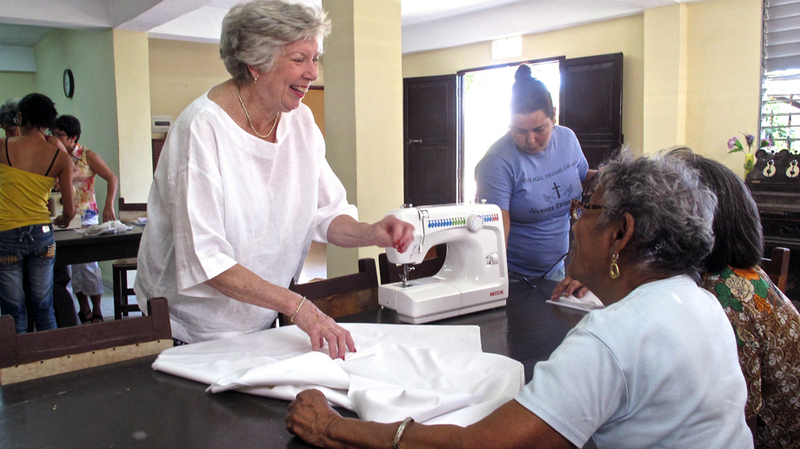 It isn’t often that altar guild can really be classified as exciting but sharing our experiences and knowledge with the Episcopal Church in Cuba brings teaching to an entirely new level. My husband and I have just returned from our fifth trip to Cuba in the past 14 years and I want to share with you how vibrant our church is in a country that has so many limitations. 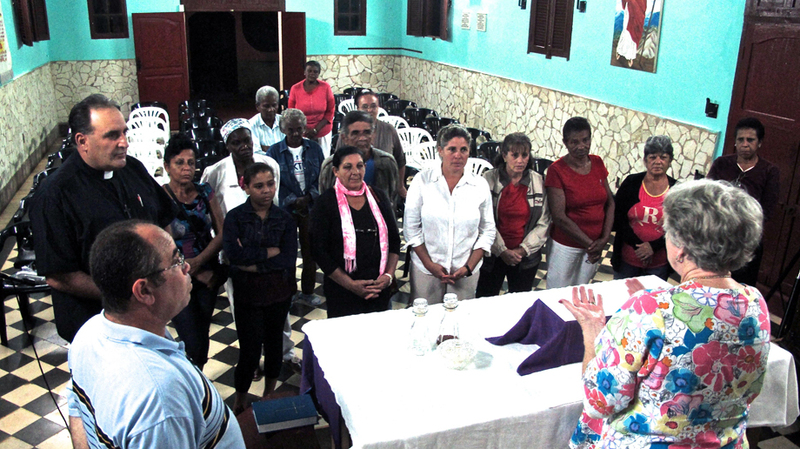 While it may seem surprising that our church is thriving in a country where religion has been suppressed, there are 44 Episcopal churches across Cuba, from the Cathedral in Havana to simple house churches with five to six people. The Cuban people are eager to live out the Gospel as the Body of Christ and, as I have become acquainted with priests and parishioners across the island, I have been asked to help with many aspects of liturgy. Their worship is very traditional and familiar to our way of doing things. They use the Spanish (blue) Book of Common Prayer in their churches and follow them faithfully. When they pass the peace, it can easily take 20 minutes. Everyone kisses each other and is loving and caring. Cubans are very compassionate. What is different is the music. They have a whole range of what might be considered “praise” music, but it is more traditional. Often they play the music on a small recorder or, in some churches, on a TV with words on the screen. We were impressed that most people seemed to have all the words memorized and they sing out with such great joy. However, they are unable buy religious goods or even fabrics, and would welcome items we can no longer use. While they often cannot buy candles, they have candlesticks. Many altars are simply nice old tables and some have very creative frontals. Their altars are adorned, often with one nice linen or a lovely tablecloth, but they need all the little white linens. Chalices and patens are impossible to obtain and they like nice, metal ones. When they receive Communion, they all intinct. A very small amount of wine is placed in the chalice and each person is given a wafer and they barely dip it. No one drinks from the chalice. The purificator is used as a napkin in case a drop of wine falls. They can buy wafers from a Roman Catholic convent in Havana. I have also seen them use bread cubes. They are eager to ordain new priests and deacons. Fortunately, there is an excellent seminary in the city of Matanzas. It is actually ecumenical but the Episcopalians have wonderful teachers and services. 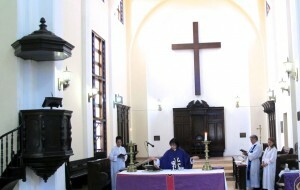 We were there for two days and went to a midweek Eucharist and a morning worship. While there, we had a chance to discuss altar guild teachings they would love to offer as part of a seminary program. One consideration could be to buy a bolt of white fabric that they can share with churches to initiate sewing projects to construct needed linens. Stoles and albs are also in popular demand. 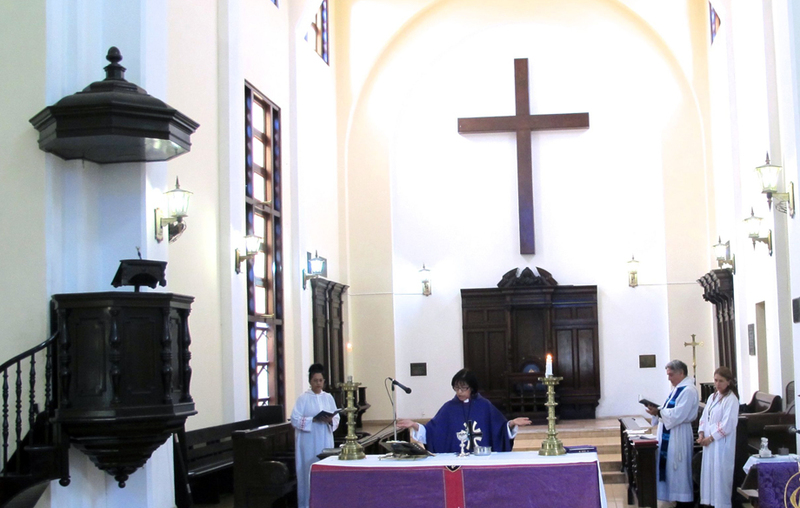 We went to ten different Episcopal churches and had Communion seven times. As it was the beginning of Advent, we brought purple candles as gifts. Their wreaths were not our pine circles but rather glittery tinsel mounds, some with candles and some using only one. In Santiago we went to house services for the lighting of the weekly candle. They prayed, sang and had refreshments. Probably 30 people attended. It was beautiful. 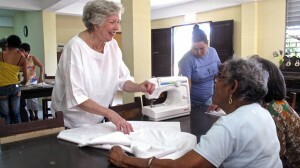 In Santiago, I was asked to lead a sewing class for 20 ladies. I brought white fabric, needles, thread, scissors and samples to copy. We had a Saturday morning workshop with three sewing machines and lots of enthusiasm. This all took place in Spanish and somehow, my college Spanish sufficed so I was able to communicate. We had tiny cups of coffee and a big cake at the end. They created purificators and corporals. In the past they had made palls stiffened with old X-ray film and thought mine were too thick. They are so creative in the face of having nothing to buy. The Bishop of Cuba, Griselda Delgado, has become a good friend. She was with me often, translating and encouraging the ladies to prepare the Lord’s Table with loving care. They loved hearing that they were part of a worldwide group and that altar guild is the same wherever you are. There are many more stories to tell but that will have to wait for another time. But I do want to share two important ways the Episcopal church is doing God’s work: having purified water available at some churches for the community to share as well as gardens where Cubans can have healthy fruits and vegetables to eat. Their diets are very restricted and food is expensive for them. Their salaries are tiny. With all the adversities, they always share and care for one another. The most valuable thing I was able to bring with me was the Spanish version of the Altar Guild Manual from the Diocese of Texas. Everyone in Cuba sends their most sincere “Gracias” to all of you who put this together nearly ten years ago. I gave out copies everywhere I went and they were so grateful. They will make more copies but since paper is hard to buy and expensive, they will happily share. Thank you, thank you for this gift that I could bring for them. Just a week after our return, President Obama opened the door of hope for the Cubans. They deserve this chance for a future and there is plenty of room for the Episcopal Church to help. Cuba is ready to move forward. They have a high literacy rate and work very hard. They will do their part. Keep them all in your prayers.